The Time Management Checklist can help you find the time for all your work or personal projects that you’ve been meaning to get around to. It’s always helpful to list out your day step-by-step. Not only are you getting in the right mindset, but you’ll never have a moment where you need to think about what to do next. The template provides you with a clear overview of all your daily details in one page. 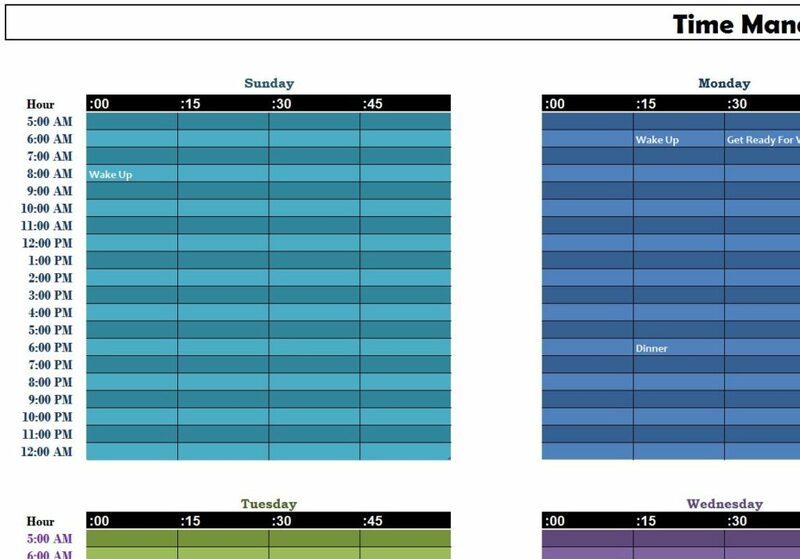 This makes it easy for you to open the template and look at your schedule for the day. You can’t wait around for success; download the free template today to start organizing your tasks efficiently. Once you have the Time Management template downloaded and opened, start in column B. Throughout the entire page, you can see how column B displays the hours in a day. Keeping that in mind, each table represents a different day of the week. When you want to enter a new item for a certain hour, just find that time and the corresponding weekdays. The time-stamps at the top of each table indicate order and duration. You can see that one of the examples lists “Wake up” in the “:00” column at 8:00 am. This way, you can break up each hour of the day as well. You will need to go through each weekday and enter your schedule by using the methods above. There are also three sections to the far right of the column. These sections are for highlighting the major objectives of your week. The first column allows you to enter major “Things to Do,” then “People to Call,” and finally “Items to Buy.” If you don’t have a specific day or time for one of these categories, list them in this section so you can cross them off whenever you have the spare time to complete them.